So far in reading through the book of Job, this has been the most difficult section for me. What does God want me to focus on? Is there anything specific in these few chapters that speak to me? Doldrums – 1. a state of inactivity or stagnation. Yeah, that would be pretty accurate right about now. I’m am focusing on a few verses. But it isn’t like there is some “Aha” moment going on. Maybe that is the point. Will I be faithful to continue reading, looking, digging, asking, even if there don’t seem to be any gold nuggets lying around? Sort of like Job. He is in a severe state of another doldrums definition himself. Doldrums – 3. a dull, listless, depressed mood; low spirits. So I continue. I read. I pause. I pray. I wait. Lord, may I always seek your will and your wisdom. May I not just blather for the purpose of filling space – like Job’s friends. In Jesus’ name, Amen. This entry was posted in My Posts and tagged Job on November 24, 2009 by tinybeetle. You see I have brown hair, sort of, and those of us with brown hair have about 110,000 hairs on our heads. Actually my hair is a now mixture of brown and gray, and to be honest my hair count is now probably well below 100,000. Therefore I can’t afford to lose any more! Just when I’m starting to look Godly… Yank. Seriously though, have you noticed that we just don’t value the aged in our society anymore? We consider them an inconvenience, a financial burden. The bible speaks quite differently about the aged. While young people may have brute force behind them, it is those with years of hard gained wisdom that can best direct them in using it. But, sadly we seldom ask for their advice and wisdom these days. Instead we relegate them to warehouses called nursing facilities and visit on holidays and birthdays. But that is a topic for a different time. John Eldredge, in his book Way of the Wild Heart wrote about the Sage, a person who has wisdom due to years of Godly living. Job likewise speaks of the same people. A Sage is someone who has gone through the stages of life identified as; child, cowboy, warrior, lover, and king. He has moved through them all, gaining experience and wisdom along the way. The end-game is that the gray-haired king steps aside for the incoming king and now exhibits his God-given glory in the role of adviser. At least that is how it is supposed to be. Of course if his wife has plucked all of his gray hair out, how will anyone know he is wise? Lord, thank you for wisdom from the aged. May I show those in my life the respect that they truly deserve. In Jesus’ name, Amen. This entry was posted in My Posts and tagged Job on November 23, 2009 by tinybeetle. I have a very large painting of a few Seagulls hanging prominently in my living room. My wife thinks it is rather ugly, frankly I’m not too excited by the composition myself – Seagulls are rats with wings. However, since our living room has a Palm-Tree border, this painting works with the decor of our home. But that is not the reason it is given a place of honor. Next year it will be 25 years since a friend of mine gave it to me as a gift. He found it by some trashcans in an alley behind a doctor’s office and asked if I’d like it. I thought that the frame might be reusable so I accepted. I’ve had the painting from 1985 – 2009 so far. It some ways it seems like a long time, but that dash between the years is just a blip in the grand scheme of things. Which brings me to the idea of the dash. I found an interesting dictionary definition of dash. It is, “a dash is used to note an abrupt break or pause in a sentence or hesitation in an utterance”. The reason this painting has meaning for me is due to another dash. It is 1972 – 1986. My friend, Cecil Todd Wilson, gave me this painting when he was 13 years old. 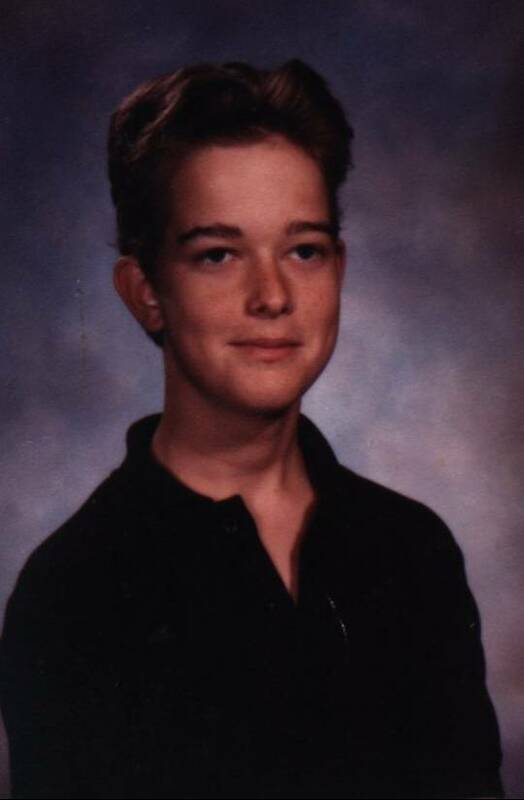 Just a few short months later, Todd (he hated to be called Cecil) was riding his bike home from school in the rain when he accidentally turned his bike in front of a car. He died instantly from the impact. The dash of his life was not even a full 14 years long. His time was up. The dash notes an abrupt break, and a pause. Had Todd lived he would have been 37 this year. As I was reading in the book of Job I was reminded of how brief life really is. From the womb to the tomb is just a dash. The question is, what do we make of that dash? Will anyone remember that we were even here? Will your life have mattered? Nearly everyone is forgotten after the third generation. Don’t believe me? What are your great-great-grandparent’s names? Where did they live? What did they do? Very rare is the person that is remembered longer. But thankfully, if we know Christ as our Lord, and more importantly if he knows us, then the dash becomes irrelevant. And a number at the end of the dash is not the end. Christ will never forget us. Everything about us is indelibly written in his books. Some day the painting my come down; it may be damaged, it may lose meaning to those that come after me, it may no longer match the decor. But Todd will never be forgotten. 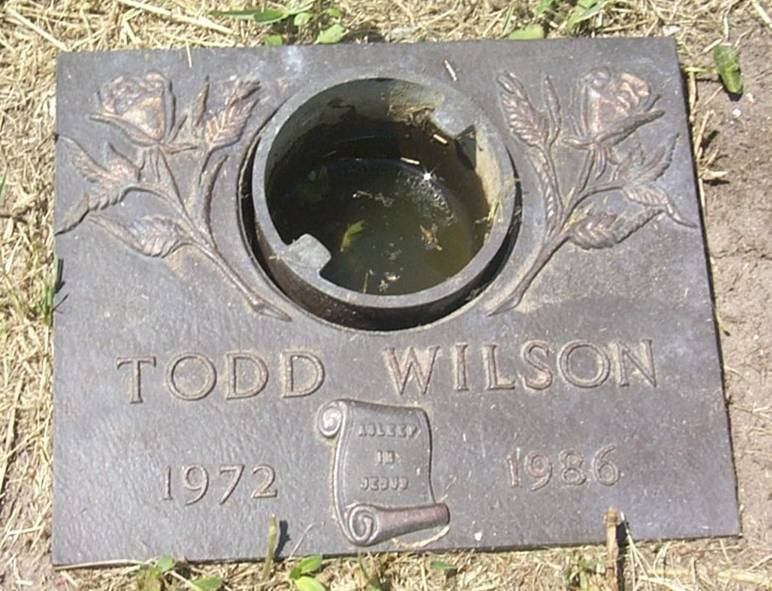 If you look closely at Todd’s grave maker you’ll see that it has a rather different dash. It says “Asleep in Jesus”, because he knew, and is known of the the Lord. He is not forgotten, no matter how many generations may pass until Jesus’ return. The dash is just a pause in the relationship, I will see him again. Father, thank you for the dash of my life thus far. Please give me the wisdom and ability to make the most of it. Help me to fulfill your great commission. In Jesus’ name, Amen. This entry was posted in My Posts and tagged friends, God, Jesus, Job on November 19, 2009 by tinybeetle. I was raised reading the King James version of the Bible. So for me the archaic English is usually not a problem. In the past few years though, I’ve been reading from some newer translations, primarily from the New Living Translation. I find that it is accurate and much easier to read. Yet on occasion I will jump back into my trusty, well-worn KJV to read some passages. I did a few days ago and encountered the following verses. What specifically stood out to me was the word ‘daysman‘. I’d never encountered it before. My KJV had a little number four next to the word, so I followed the reference to an alternate meaning – ‘umpire‘. Ok, batter up… No, not really. So I dug some more. This word (daysman) is formed from the Latin diem dicere, i.e., to fix a day for hearing a cause. Such an one is empowered by mutual consent to decide the cause, and to “lay his hand”, i.e., to impose his authority, on both, and enforce his sentence. I sensed there was more, so I looked up the word umpire. This brings things into a much clearer light. If I had simply read a modern translation I would have missed the nuance of what was being asked. If I was to simply look at the word arbitrate, or mediate, I would miss the fact that Yakach, the Hebrew word used, is really referring to someone that is not partial to the case, different, entirely set-apart from either party, someone who has no vested interest in the outcome. But really, someone who has no vested interest in either? How could Job ever hope to have a case like that decided in his favor vs. God? Likewise, how could we? The Bible tells me that my righteousness is literally just as disgusting as used maxi-pads (Isaiah 64:6). So no matter how much good we, or Job ever did, our effort would never measure up. The daysman would have to rule against us. What we need is a mediator, one who stands in the middle bridging the gap to bring both parties of a dispute together. Thankfully we don’t have a daysman, we do have a mediator. Unlike Job’s wished for daysman, our mediator is like us. But, he is also God. Therefore he is quite partial to the case, on both sides. He is intertwined with both parties and he does have a vested interest. He came to Earth for the specific mission of bridging the gap. Since he is the one doing it, my works or lack thereof are not a consideration in the case. The only thing that is considered is have I relied upon Jesus to place his hand on me, and allowed him to move me into his father’s presence. Heavenly Father, thank you for sending Jesus as my mediator. May I always rely on his righteousness and not mine. In Jesus’ name, Amen. 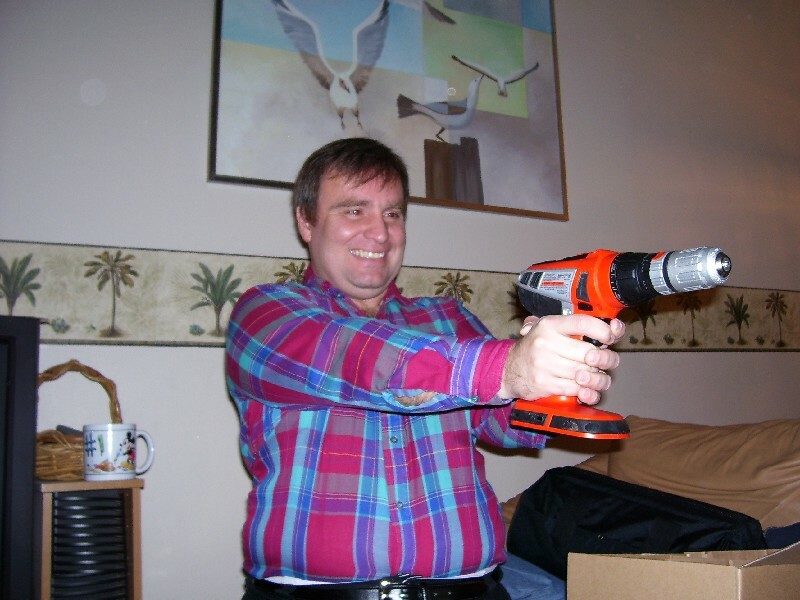 This entry was posted in My Posts and tagged God, Jesus, Job on November 18, 2009 by tinybeetle. A number of years ago I found a terrific brand of black work shoe that I truly like at Payless Shoes. They have an air-pillow insole, leather uppers, and they are oil and slip resistant. The heel is about one inch high, and the sole is about half an inch high. That means they are comfortable and durable. Additionally, being at least half an inch off the ground means that I can step right through most puddles without worrying about getting my feet wet. I hate wet squishy shoes. And living in Florida where it rains a lot means there are plenty of opportunities to find puddles, so shoe-height is important to me. There is an old Indian proverb that says, do not judge a man until you’ve walked a mile in his moccasins. If I could remember the brand of shoe I wear, I’d recommend you get some and walk a few miles in them. Which brings me to Bildad the Shuhite. His opening words to Job must have cut like a knife. This is a guy who has not stopped to put on Job’s moccasins. He has no true concept of what is really going on in Job’s life, but he’s decided that he knows the path Job has been on and which one Job must take. I think he is walking right into some pretty nasty puddles of condemnation, and Bildad’s shoe-height isn’t enough to keep his feet from soaking in the stinking sop. Instead of simply sitting and mourning with his friend, he joined in the self-righteous parade. The sad thing is that I’m just as guilty. I may not say things to someone’s face, but in my heart I have. I’ve harbored thoughts and doubts deep down about a person’s motives, walk, and relationship with God based upon their external circumstances. But that is exactly where the crux of the matter lies, the heart. God looks at the heart, not the external. He will allow whatever is necessary to accomplish his result of molding our heart into one that is in the image of his son’s. So, while I’m busy being shoe-deep in crud, thinking self-righteous thoughts, God is shaping someone’s heart to be what he desires it to be. If I’m honest I have to admit that I’m more Bildad with the rather low shoe-height than I am Jesus. But I want to be different. Heavenly Father, please give the desire and ability to look at the heart, not the external. Please give me a discerning spirit. In Jesus’ name, Amen. This entry was posted in My Posts and tagged bible, friends, God, Job on November 16, 2009 by tinybeetle.